Fleas are the worst. They're itchy, they're pesky, and they can seem nearly impossible to get rid of. Unfortunately, once your pet gets them, you need to do a debug of all animals in the home and the home itself since fleas jump from host to host and multiply quickly. Ticks are also problem pests when it comes to our beloved pets, especially after a walk in the woods or a romp in the dog park. Your backyard can be another potential source, especially if you have bushes or tall grass. 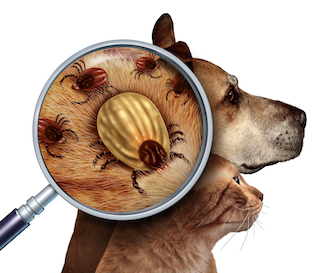 Both fleas and ticks can carry diseases that can put your pets and your family in danger. This is why flea and tick control is so important, even before you spot these pests. Here are tried and true tips to prevent small problems from developing into big problems. There are three main product forms to meet your needs. Pills: These are the "latest generation" of flea & tick control products and are convenient, highly effective and typically provide protection for a full month. They come in flavors that most pets like, but if your pet resists taking pills, you can slather the pill in wet food or peanut butter and your pet is none the wiser. Drops: You can put a preventative drop at the neck of your pet every month, or along your pet's back to keep fleas and ticks from biting, which also kills any pests that are already present. Keep your family members from petting the animal right after this liquid has been applied. Collar: There are also flea and tick prevention collars that your pet can wear for up to eight months at a time. If you're really terrible at remembering to give your pet his dose of prevention medication, this might be your best bet. You need to treat all of the potentially affected areas simultaneously to ensure that all live bugs and eggs have been killed and disposed of. First, if you have missed your pet's regular flea & tick treatment, you'll want to kill all live bugs on your pet(s) with a flea pill or spot treatment. For those pets who love water, another option is to try a flea or tick bath. For your home, try a carpet spray that you can spray throughout each room. Let it sit briefly before vacuuming your entire house. Dispose of the vacuum bag or container immediately to ensure no fleas get back out and into your home. You can also try a fogger, but the carpet sprays are safer. With a fogger, you and your pets cannot be in the house. Keep an additional can of carpet spray on hand to continue to spray around your home for a few days until you're sure that every last flea has met its match. Fleas and ticks are no picnic in the park. But the old saying is still true, prevention is the best medicine!